How much do you really know about veteran mental health? Are you aware that it goes beyond just the common misconceptions that a majority of veterans struggle with Posttraumatic Stress Disorder and Traumatic Brain Injury? Over the past year, I’ve had many discussions with veterans, their family members, and those who serve veterans about this topic. One of the first questions I ask: what is the single biggest challenge that veterans face when it comes to mental health? While the answers vary, the majority of people consider PTSD, suicide, and military transition the largest problem that veterans face. They’re not too far off base. The more combat veterans there are, the more likely those veterans have experienced a traumatic event. There is a greater chance of PTSD. And many in the veteran community are aware that suicide is an epidemic. There are certainly struggles in military transition. In my experience, however, not all veterans I work with as a mental health professional are struggling with PTSD, and certainly not PTSD alone. And suicide is a symptom of an underlying problem, not a problem to be solved itself. It’s as if people said, “we must stop people from having a runny nose” or “we have to stop the headache problem.” I’m not minimizing the impact of suicide by trying to make it a trivial symptom, but it is an indicated of a deeper unresolved issue. And struggles in military transition are the result of unresolved problems not the problem itself. I’ve written on the topic of looking beyond PTSD and TBI before. That series of posts was the genesis of this upcoming project. As I worked with veterans, I noticed that there were some things that they were experiencing that go beyond just PTSD and TBI. These included a lack of purpose and meaning, emotional dysregulation due to learned helplessness, moral injury, and frustration due to an inability to meet their needs after leaving the military. After writing this series of articles, and having discussions about them, I saw a greater need to explain more. In March of 2017, I was invited to present the keynote address for the Military and Government Counseling Association. I talked about ethics and cultural competence when working with veterans. 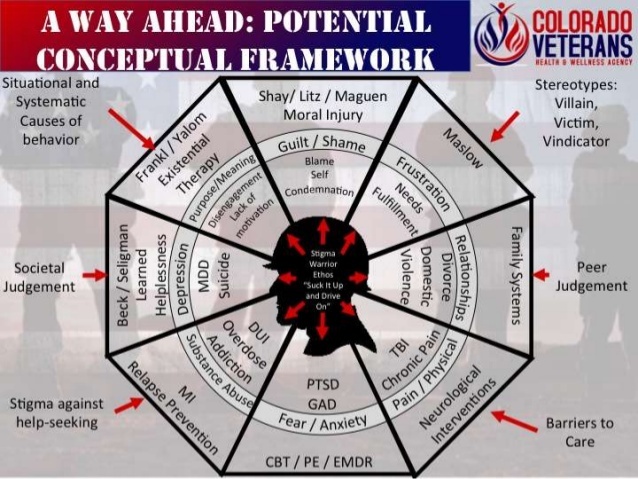 Essentially, the point was that, if a mental health professional is going to work with a veteran, they need to understand all aspects of the veteran’s mental health needs, not just PTSD and TBI. Similarly, if a veteran was going to address their concerns, they needed to know more about what they are experiencing. Another point was that the mental health profession is uniquely qualified to help veterans across all of these concerns; yes, we have procedures and protocols to help treat and resolve PTSD. We have interventions to diagnose and support recovery from TBI. We also, however, have theories and interventions that address all of these concerns. If mental health professionals are not looking for them, we are going to use the wrong tool for the job. Here is an overview of the conceptual framework that the series will cover. Each of the areas that are covered include the indicator of the problem, the problem itself, and the therapeutic intervention or theory that can help alleviate that problem. The internal and external pressures that keep a veteran from addressing these problems are also identified. In order to provide a deeper understanding of these concepts, I have been putting together a series of podcasts. This series will be released over the next two weeks, addressing each of these topics, and a little bit more. The series will be called Veteran Mental Health Bootcamp: Advanced Training for Your Brain. 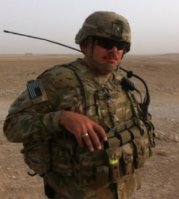 I have been having conversations with veterans and mental health professionals across the nation about each of these topics, and will be sharing these conversations with you. So why now? As we approach the end of the year, many will be making new years resolutions. Wanting to make a change. I’m not so naive as to think that many veterans will be making a new years resolution to seek mental health counseling, but why not, right? Regardless, it is a time of reflection and understanding. It is also a time in which may involve you traveling a lot, maybe a lot of down time. I’m not going to sugar coat it: there will be over twelve hours of conversations coming over the next two weeks. If you’re driving from Baltimore to Atlanta, or Denver to Chicago, though, you have a lot of time to pass. This could be a way to get some good info that could probably help save a life. I look forward to sharing this information with you. I hope that this supports recovery and wellness in our service member’s post-military lives.